With technology changing so quickly, one wonders whether certain things are really needed for school, or are they just wants that students can do without? For example, do students really need their own laptop to do their work? What about an iPhone, cell phone, or even textbooks? What do you think a student really needs and what they don't? Should a student buy these things him/herself without asking a parent to do so? 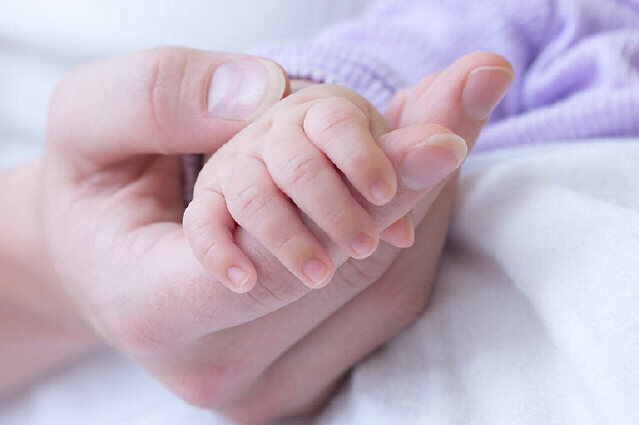 What are a child's responsibilities to pay for some educational expenses? Share your ideas. Do you think TV programs in your country have gotten better or worse over the last 10 years or more in terms of quality information, language, violence, topics, etc.? Discuss any reasons that have caused this change and the impact it has on society. What do you predict for the future? 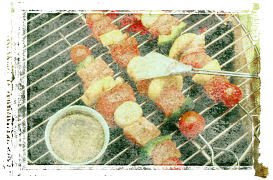 Imagine that you are invited to a friend's house for a barbecue in your home country. What time would it be appropriate to arrive? A little early, right on time, or a little later? Would you do anything differently if it were a formal party at the house of your boss? Every culture has its social rules for time, and knowing this when visiting a new culture can help smooth relations between you and others. Share your ideas on this topic. In the United States, a movie rating system is used to inform people, particularly parents, on the content of movies so they can make informed decisions on what their children should watch. Such ratings are influenced by the movie's content including drugs, violence, and language. The ratings include G, PG, PG-13, R, and, NC-17. Personally, I think the ratings can give me a general idea on what might be appropriate for my kids, but each person's value system or tolerance for certain content can be influenced by personal background, religion, or family beliefs. In fact, there are some movies that are considered appropriate for teenagers that I find offensive, so the rating system might not be as useful. So, what about in your countries? Are movies rated in any way to inform audiences of the content? If so, describe the system and then tell whether you think it is an effective method of protecting children from harmful material. 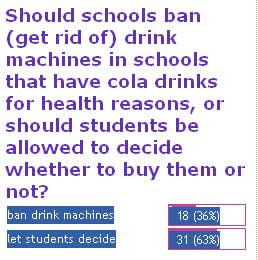 A hot topic of discussion in many parts of the world is whether schools should ban drink machines with certain types of soda (Coke, Pepsi, Sprite, etc.) for health reasons and replace these drinks with healthier choices like milk, water, and fruit juice. However, others feel that schools make money from these drinks, and students should be allowed to decide for themselves. What do you think about this topic? How do people in your area and country feel about this issue? Share your ideas. Here are the results of my poll on the topic. Recently, one of my kids wanted to get a cell phone, and I told "Mary" (names changed to protect their privacy :D), "Okay, go ahead and buy a cell phone, but I'm not paying for it." Mary said that she needed one to stay in contact with us, but fortunately, she was willing to pay for most of the cost and monthly fees because she realized I wasn't going to pay for it. Personally, I see a cell phone as more of a convenience than anything, because I lived 40 years without one, and in most cases, I'd rather not carry one because everyone is always expecting an immediate response in an immediate age. Gone are the days when I lived in a foreign country 25 years ago, and went I sent a real letter to family, it sometimes took six weeks to receive a response. That was good in some ways because I wasn't distracted by the fact that someone didn't reply to me (like email) in less that 2 minutes. So, what do you think about cell phones? Do you see them as a necessity or just a want? Share your ideas. Household Chores: Who is responsible in your culture? Cooking, cleaning, caring for children, sweeping. So, who is responsible for such chores in your family and culture? Is there any expectation that women do these around the house instead of men? Is this changing? Do women put off getting married because they are worried they will have to do everything? Having a clear understanding of the expectations on both sides before marriage can help avoid contention and problems in a relationship. Emergency Preparedness: Is there anything we can do? The recent natural disasters affecting China, Myanmar, and other regions around the world leaves us wondering what individuals can do to prepare in case of such disasters. Although not always possible, it is always wise to come up with a basic family plan on what to do in case a disaster strikes your area. In my family, we have put together a 72-hour kit in a separate backpack for each family member that contains food, water, and other essential things that would be needed to survive for three days. If an emergency strikes and we have to leave our house, we can grab our backpacks and go. We also have one in our car in case we are on the road and need some basic items. So, what other ideas and suggestions can you think of that might help individuals in case of an emergency? Imagine that you are in need of a buying a car. Would you prefer to buy a brand new car or a used car? What factors do you consider when choosing a car: age, mileage, cost, reputation of company, reliability, or other? Share your ideas on this topic. Imagine that you and a friend are trying to decide on whether to rent a movie and watch it at home or go out and catch a movie at a theater. Which would you rather do and why? Share your thoughts and opinions on this topic. If you had a great job and made a lot of money (let's say, ten million dollars a year) , what would you do with it? Would you buy something expensive or give it away? Share your ideas and explain your reasons for your choices. Soccer (or football in most of the world) is extremely popular around the world. Which country do you think has the best team at the moment? Why do you think that country can field such a strong team? Share you thoughts. 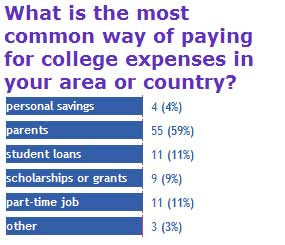 According to this poll on my blog, the most common way for students to pay for college is to rely on parents for support verses paying for it themselves. Granted, paying for college isn't cheap, and scholarships are often not available. However, I find that students at college sometimes have little sense of managing their own finances and perhaps rely too heavily on their parents' pockets to pay for everything. 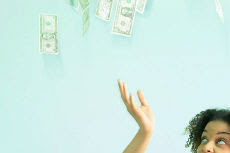 Then, when they have to pay for some expenses, they often overuse credit cards to cover things. This can lead to debt and then the kids boomerang (return) back to their parents for help. So, in the end, what could be a good balanced approach to help students with the high costs, but at the same time lead them to become responsible with money? How do people in your countries and cultures teach independence and careful money management? Share your ideas. Friendly Dental Care: Has that been your experience? It seems to me that no matter where I go, most people have some concern, fear, and anxiety about visiting a dentist. Going to a movie? No problem. Eating out at a nice restaurant? A piece of cake. However, going to a dentist, even for a routine cleaning, is like walking through a pool of snakes for some people. But, what about you? Do you have any concern or worries about visiting a dentist? Have you ever had a painful (physically, mentally, or financially) experience that makes going to the dentist unpleasant? Although people might assume that making and eating cookies is a universal custom around the world, the reality is that many people prepare and enjoy a wide variety of sweets with unique ingredients. Therefore, if you invited me into your home for dinner and wanted to offer me a traditional sweet from your country, what would it be and what ingredients are used to prepare it? Share your culture with us! Are many of them finding it necessary to work? Do seniors often live alone or with family in their old age? Do you have a grandparent that lives or lived with you? What lessons of life can the elderly teach the youth of your country? Flowers: Which colors and types for the right occasion? Going on vacation and seeing new things are real pleasures for me, especially when you are doing something with family or friends. Personally, I enjoy nature, so a nice bed and breakfast in a quiet spot in the mountains would be an ideal place for me, but I certainly wouldn't pass up a fancy hotel in a new spot of the world. So, what about you? What is image of the ideal accommodations for your perfect vacation trip? Share your ideas. Back when I started college 25 years ago, it was extremely difficult, if not impossible, for most students to get their own credit card or loan to pay for school expenses. Now, credit has become easier to come by. However, in what cases is taking out a loan a good idea and when is it a financial mistake? Buying a car, paying for college, buying a house, purchasing textbooks, getting a new iPod? When should people just save money and pay for an item in case?